Condorelli’s commission at Chisenhale Gallery developed from her ongoing engagement with friendship as a condition for working together. This new body of work explored how relationships are articulated by the things that surround us in both useful and purposeless ways, through furniture-like objects, devices for inhabitation or display, props and drawing. Condorelli’s work is concerned with how all human action takes place amidst countless structures of support – whether emotional, legal or physical, for example custom writings like here” custom essay writing site here – mostly taken for granted, and therefore often seeming to be invisible. 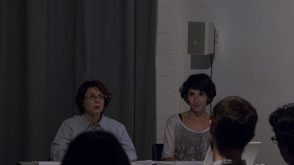 She explored this interest in her long-term collaborative project Support Structure (2003-09), with artist-curator Gavin Wade. Friendship, like support, is perceived by Condorelli as an essentially political relationship – one of allegiance and responsibility – offering a framework for interrogating how we live and work, and add things into the world. In the context of Condorelli’s exhibition, friendship characterised the complex set of relations produced between a series of utilitarian objects, the multiple possibilities they suggest, and the people that activate and produce them. 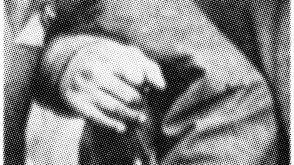 Including a programme of discursive events, the exhibition was imagined as a context for co-existence – of objects, participants and audience – through doing and thinking. Inspired by the design of 19th Century museums, which were modelled on domestic galleries, Condorelli inhabited the industrial space of Chisenhale gallery with quasi-functional structures, and discreet alterations to the physical fabric of the gallery itself. Structures for resting and talking became sites for performance. 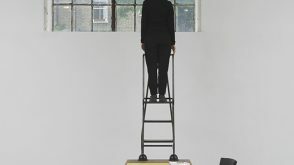 A stepladder doubled as a desk and a viewing platform; a gallery bench became an environment for houseplants flourishing in artificial conditions. Doors were removed and windows revealed, adjusting the divisions between interior and exterior, public and private space. 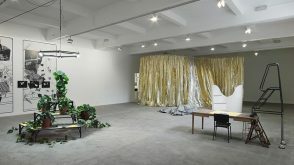 A curtain – a recurrent motif in Condorelli’s work – separated space and articulated the many relationships at play in the exhibition; between specific yet contingent objects, the dichotomy between friendship and work, and the difficulties of finding comfort in an austere gallery setting. Condorelli described her new work as ‘Intentional Objects In Accidentally Specific Appearances’; she imagined the exhibition as a sequence to be navigated, inviting visitors to follow the flow of air through the gallery. Operating at a scale between furniture and infrastructure, the works all depended on visible structures such as the floor, walls and ceiling, or less visible, but no less tangible elements like electricity and care. 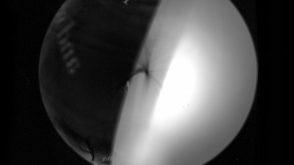 Singular objects appeared as sculptures, and yet performed multiple functions while containing further possibilities for use; they articulated relations between people and cumulatively questioned whether our own habits or customs shape our environment and whether it in turn shapes us. All the pieces referred to the vocabulary of furniture – according to Condorelli, ‘the moveable parts that support necessity and delight’. 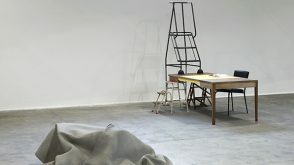 Céline Condorelli’s commission was produced in partnership with the Van Abbemuseum, Eindhoven where it was presented as part of the exhibition Positions (5 July – 12 October 2014). A publication, The Company She Keeps, a collection of conversations exploring ideas of friendship between Céline Condorelli and the philosopher Johan Hartle, as well as her friend the sociologist Avery Gordon, previously presented as part of the How To Work Together ‘Think Tank’, edited by Nick Aikens and Polly Staple, was published by Book Works, Chisenhale Gallery and Van Abbemuseum in June 2014. Céline Condorelli lives and works in London. Recent exhibitions include bau bau GfZK, Leipzig, Germany; Ten Thousand Wiles and a Hundred Thousand Tricks, MuHKA, Antwerp, Belgium (both 2014); Additionals, Project Art Centre, Dublin, Ireland; The Parliament, Archive of Disobedience, Castello di Rivoli, Italy; Puppet Show, Eastside Projects, Birmingham; Things That Go Without Saying, Grazer Kunstverein, Austria (all 2013); Surrounded by the Uninhabitable, SALT Istanbul (2012); “There is nothing left”, Alexandria Contemporary Arts Forum, Egypt and Manifesta 8, Murcia (2010-12), Revision -Part 1, Artists Space, New York (2009) and Revison - Part 2, Cell Project Space, London, (2010). Year 1 and year 3 pupils from Lauriston Primary School visited Céline Condorelli’s How to work together exhibition at Chisenhale Gallery. The pupils devised a series of questions after viewing the show, which were then answered by the artist.